Today, there are hundreds of CRM Solutions for all size businesses - from a one-person company Small Office (or Home Office) to tens of thousands of employees in a Fortune 100 company. Now all the leading CRM Solutions are built with Cloud and Mobile Technology (or they're rewriting their old CRM software using the new technology). You typically pay an implementation fee and an on-going monthly fee per user per month.... forever. Since there are so many solutions and so many vendors that use the "CRM" definition in so many ways, we decided to help summarize the different levels of CRM in Business. 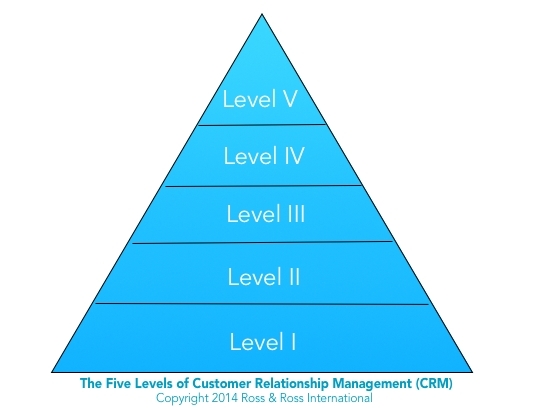 There are five typical levels of CRM in business today. Which level is your company? You use email and business cards to contact customers and prospects. You keep them in a desk drawer, a business card book or in an envelope marked with the marketing source of the cards. Or, you may keep everything in your head. Some of you may still use a flip phone (feature phone) for making calls. If you have a smartphone, you just use it for making calls and taking pictures. You use Microsoft Outlook (or maybe Google gmail) to send out mass emails, like an eNewsletter. Phone Calling Lists with names and phone numbers are also kept in Microsoft Excel Spreadsheets. You print out the lists, use them to call and check off the names when you call someone. You write very small "LM" for left message, maybe the date called. Sometimes you update the Excel Spreadsheet, sometimes you don't get around to it. Now we're getting some place. You implemented a Small Business Low-Cost CRM and use an outside eMail Service for mass emails. The CRM gives you real-time Sales Reports and the eMail Service gives you detailed reports on your eNewsletter and other eMailings. The CRM system may be free for the first one to three users or you pay $5 to $30 per user, per month for your CRM System. You invested in a top-rated CRM with lots of features that you don't use. Reps have minimal training, You may have a couple of plugin add-on services. The company has under invested in Systems Administration resources. Your sales team is using the standard configuration with very little modification. You use Excel for Sales Reporting each weekend. Some companies have their Outlook or Google gmail synced to the CRM System which improves sales productivity alone. The bottom line is that you have lots of potential but only limited sales productivity. The company spent a significant amount of time planning and implementing your CRM system. You trained your team as part of the roll-out and have a training program each quarter. You implemented a top-rated CRM. You invested in special add-on Software Plugins (some of which may include: Sales Reporting, Quotes, Proposals, Social Media, Staff Recognition, and more) and you are integrated with other Company Systems (including Marketing, Customer Service, Support, Orders, eCommerce, etc). The company spent a significant amount of time planning and implementing your CRM system. Your Top Executives are active CRM leaders for the company. You fully trained your team as part of the roll-out and have an on-going training program each month. You implemented a top-rated CRM that you are using to its full potential. Sales Teams are coached on a regular basis. You use special sales reporting software to provide all your sales forecasts and executive reporting. As a result, your company has a World-Class Sales Team. They are very productive and out-perform the competition in sales and in customer satisfaction. We hope this article helped explain the different ways CRM Systems are used today in business. Please share your thoughts and ideas below. If you want to improve your sales productivity, we may be able to help. We specialize in conducting CRM Assessments within 2-3 weeks that produce a 10x ROI in months. For every dollar you spend with us, you should get a 10x return on your investment. Let's talk!